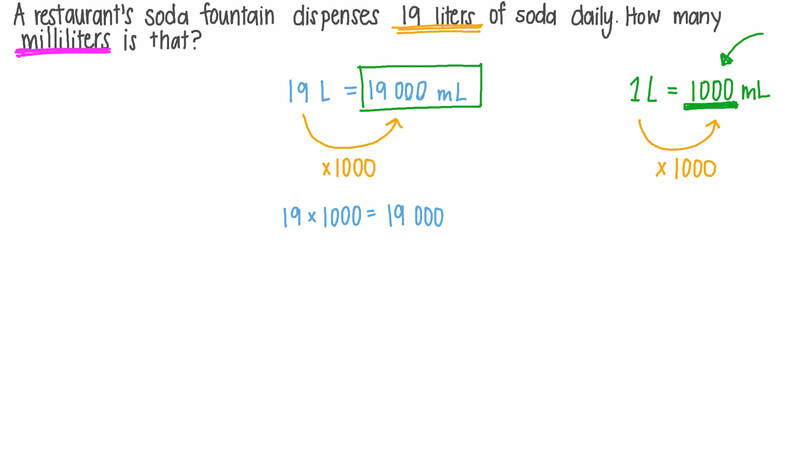 In this lesson, we will learn how to convert capacity units within the metric system, such as liters and milliliters. How many millilitres are there in 18 litres? A restaurant’s soda fountain dispenses 19 liters of soda daily. How many milliliters is that? The table shows the amount of liquid that Sally drinks each day. How many litres of liquid does she drink every day? Complete the following: 5 2 5 6 = L k L .
How many kilolitres are there in 34 207 mL? A leak in a shower head wastes 23 litres of water every week. How many millilitres of water is wasted? How many millilitres are there in 8.1 L? Write in litres: 175 mL. Fill in the blanks: 5 7 1 = m L L .
Use < , = , or > to complete the following: 8 . 6 6 0 0 0 L m L .
Each week, a family consumes six 693-milliliter bottles of orange juice. Determine, in liters, the amount of orange juice in each bottle. Maged and Sherif are calculating how many litres there are in 40 millilitres. Maged thinks the result is 40 000 L, and Sherif thinks it is 0.04 L. Who is correct? The given table shows the number of fizzy drinks sold in Mr Karim’s shop yesterday. Did he sell more than millilitres? Round 2 392 mL to the nearest litre. Write the answer in millilitres: 3 . 1 5 + 6 , 2 5 0 L m L .
How many 210 mL bottles are needed to hold 84 litres of water? 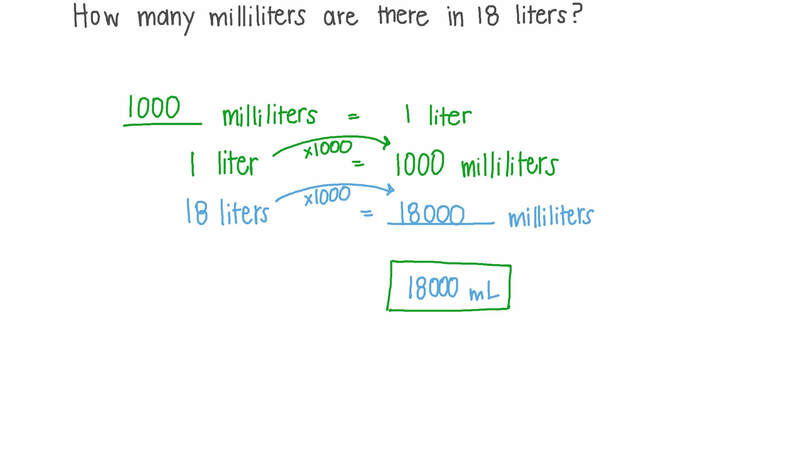 Write in millilitres: 1.025 L.
Evaluate 9 0 0 + 8 0 0 0 m L c m 3 . 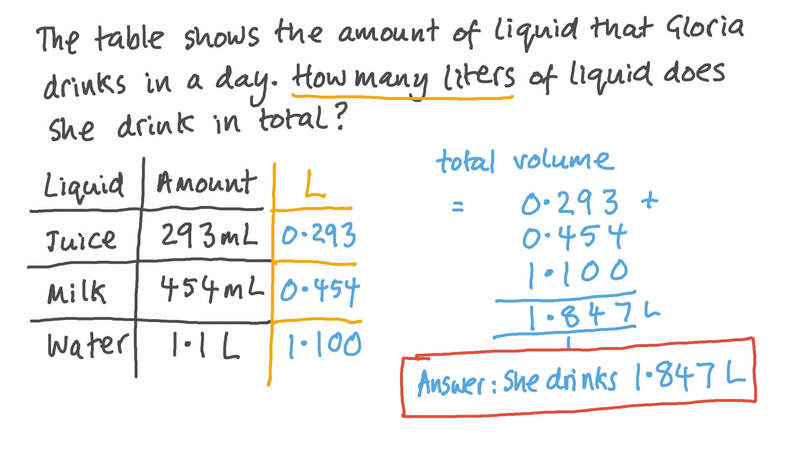 Write your answer in litres. One jar holds 400 cm3 of honey. How many jars are needed to hold 26 liters of honey? A shop sells 20-millilitre bottles of essential oils. Express, in litres, the amount of essential oil in 1 505 bottles.